Try our twist on Chicken and Waffles made with Campbells® Cream of Chicken Condensed Soup, simmered chunks of chicken, and fresh herbs poured over waffles and topped with a touch of maple syrup. cooked breaded popcorn chicken, individual pieces	 56 ea. frozen mini waffles, whole waffle (4 squares)	 14 ea. 1. Cook chicken and waffles according to package instructions. hot pepper sauce	 2 1/2 tbsp. 2. In a large pan, heat oil over medium-high heat. Add onions. Sauté 7-8 minutes until they start to brown. 3. 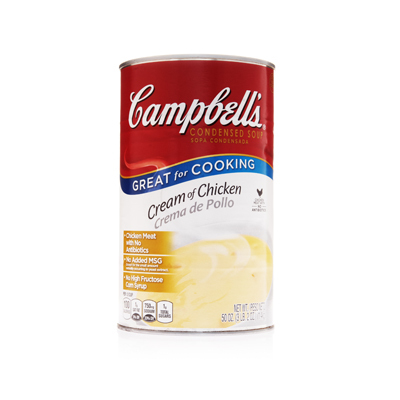 Stir in Campbells® Cream of Chicken Soup and water. Bring to a simmer. 4. Mix in syrup and hot sauce. Return to a simmer. 5. Add green onions. Reserve. 6. To Assemble: Break waffles into 4- mini pieces. Place each hot waffle piece on a sheet pan. Top each waffle piece with the following and serve immediately. cooked breaded popcorn chicken	 56 ea. frozen mini waffles	 14 ea. 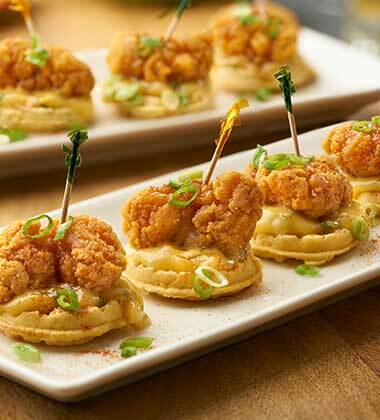 Variations: For a larger format, use a full-size waffle with chicken gravy and several popcorn chicken pieces on top. Flavor Variations: Remove maple syrup and replace with blue cheese and extra hot sauce. Try combining French Toast/Pancake with this concept.